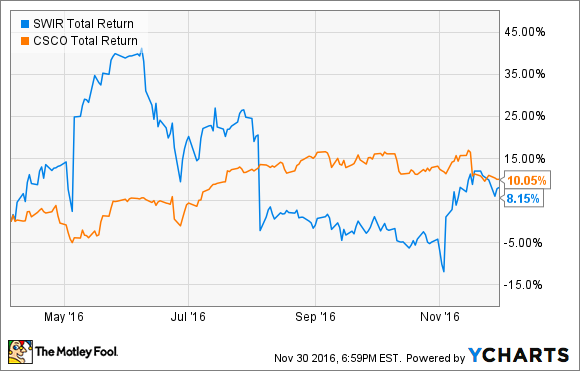 From an industry titan to a small-cap growth play, these two Internet of Things stocks couldn't be more different. So which should you buy? This past April, I went out on a limb to explore which "Internet of Things" company was the better buy from an investment standpoint: Cisco Systems (NASDAQ:CSCO) or Sierra Wireless (NASDAQ:SWIR)? At the time -- and with the caveat that it was certainly the higher-risk option -- I chose Sierra Wireless as a smaller, nimbler pure play on the trend of adding internet connectivity to otherwise ordinary devices. So how has that pick turned out so far? And which stock is the better buy today? For perspective, Sierra Wireless quickly appeared to validate my initial choice, as shares skyrocketed more than 20% after the company released better-than-expected first-quarter results in early May, and further suggested that the business should gain strength as the year continued. For the latter, Sierra Wireless credited an impending combination of new Internet of Things product introductions and contributions from newer customer programs. SWIR Total Return Price data by YCharts. The market frowned as Sierra Wireless management warned in August that, despite continued strong contributions from new OEM programs, as expected, signs had surfaced indicating softer demand and tight inventory management from existing OEM customer and programs in the near term. Early last month, however, Sierra Wireless stock came roaring back, skyrocketing more than 14% in a single day after the company not only delivered as promised for its most recent quarter -- revenue fell slightly on a year-over-year basis, to $153.6 million, driven by a decline in its OEM solutions segment -- but also indicated that the worst of that short-term demand lull appeared to have passed. As such, Sierra Wireless expects to return to sequential and year-over-year growth in the fourth quarter. On top of that, Sierra Wireless also struck several intriguing partnerships with telecoms, including AT&T and Verizon, as well as leading OEMs, to pilot its new Cat-M1 and NB1 devices for next-gen LTE-M cellular network technologies. Finally, the small company continued to expand its short-range wireless portfolio and improve its positioning with OEMS through its $6.5 million strategic acquisition of Bluetooth innovator Blue Creation. That's not to say Cisco hasn't been busy improving its own market positioning in the meantime. Keeping in mind that Cisco is more than 300 times Sierra Wireless' size in terms of market capitalization -- at nearly $148 billion compared to Sierra Wireless' $477 million as of this writing -- the networking juggernaut tackled no less than three software and cloud-computing acquisitions over the past few months in its ongoing transition away from networking hardware and toward more recurring revenue sources. Among its most recent acquisitions are cloud access security broker CloudLock for $293 million in June, enterprise container specialist ContainerX for an undisclosed amount in August, and collaboration software company Heroik Labs (also known as Worklife) for an undisclosed amount in October. For investors hoping for a better entry point as Cisco stock has steadily climbed this year, Cisco may have provided just the opportunity last month, as shares declined 5% following its most recent earnings report. In it, Cisco management warned of an expected decline of 2% to 4% in revenue for the current quarter, blaming macroeconomic uncertainty for softer-than-expected orders from service providers, which represent around 25% of its business, and to a lesser extent, declines from customers in emerging markets. To be fair, that doesn't change the fact that Cisco remains solidly profitable. And the company's longer-term expectations for solid 3% to 6% annual revenue growth remain intact. In the meantime, we can safely expect Cisco will maintain its relentless focus on operational efficiency while returning healthy amounts of cash to investors through both its share repurchases -- $1 billion last quarter alone -- and its healthy dividend, yielding 3.5% at today's prices. So which is the better buy? That depends on your tolerance for volatility and risk. But personally, my threshold for both is relatively high, so I've hardly blinked as Sierra Wireless took investors on roller coaster rides for much of this year en route to its modest gains. And considering Sierra Wireless is operating from a position of relative strength today, thanks to its strong quarterly report last month, I'm still more than comfortable betting on Sierra Wireless' superior potential for achieving outsized gains from its significantly smaller base over the long term.